By six months, babies can start to move around their space by crawling, scooting, pulling up, and creeping. Materials for this age group are focused on encouraging movement, and creating a space where a child can explore without adult interference. Avoid any sort of containers that restrict movement like bouncy seats, jumpers, activity chairs, and walkers. These items directly oppose a child's natural inclination to strengthen her muscles and practice movement. Car seats, strollers, and high chairs can be useful devices, but time spent in them should be limited as much as possible. A wall-mounted pull-up bar is a fantastic material for a newly mobile child. It helps a child enter and maintain a standing position without restricting movement like a walker or bouncy seat would. For maximum fun, install the pull-up bar in front of a child-height unbreakable mirror. The egg and cup is a classic Montessori material for this age group. It's a very simple puzzle that practices hand-eye coordination and concentration. An adult might not find this puzzle very interesting, but to a child at the right developmental stage (around nine months), it's a fascinating and challenging puzzle. 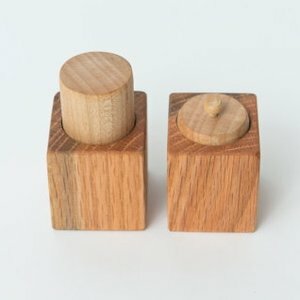 Another simple but fascinating puzzle for children around eight or nine months are palmar and pincer blocks. These puzzles practice two distinct fine motor skills—the palmar (whole hand) grip, and the pincer (two finger) grip. And the concentration required to complete the puzzle is fantastic practice for a developing child. The only Montessori approved walking aid is a walker wagon. A push wagon offers a child a stable surface to assist in balance without negatively affecting her gait. And since the wagon doesn't restrict her movements, she can choose to start and stop using it on her own terms. The walker wagon stays interesting even after a child learns to walk, since she can use it to carry toys and other objects. 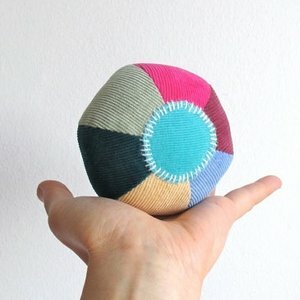 A soft ball is a fantastic toy for newly mobile babies. It will roll away, but slowly enough to encourage a child to crawl after it.